If cars were sold by the pound, this would be a heck of a deal, especially when compared to the Renault above. The Renault will cost you $2.18 per pound. This Lincoln is just .50¢ per pound. It's a bit coincidental that JaCG reader, Dan, sent me the link to this car today. I saw one for sale - not even close to as nice as this one - Monday and commented to a friend about how massive it was. These cars are huge. My BMW looked like a Smart parked next to it. 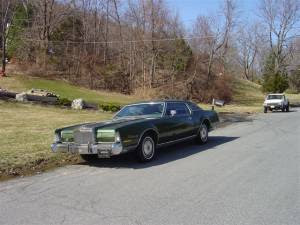 This was Lincoln's "personal luxury" car in the 1970s. It had all the (now cliche) things Lincoln was known for; a spare tire bump (which didn't hold a spare tire), opera windows (I have no idea why they were called that), vinyl roof, tall upright grille, etc., etc. The Mark IV did have one really neat feature, a braking system Lincoln called "Sure-Track." It was an early form of ABS. The Mark IV was a sales success. 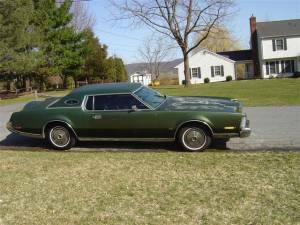 Lincoln sold just under 70,000 of them in 1973. Cadillac, whose Eldorado had been the benchmark for US personal luxury cars, sold 62,000 Eldorados. 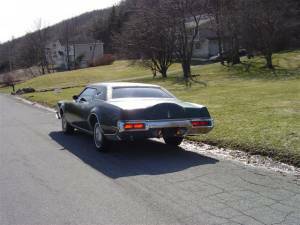 It was the second year in a row that the Mark IV out sold the Eldorado. This Mark IV looks to be in very nice shape. The seller says it has just 89,000 miles on it and has a rebuilt engine and transmission. Located in Franklin, NJ, click here to see the Craigslist ad. Buy it and play "Cannon" private detective.... Appreciate JACG!